Pipe and Drape Online is proud to be your one-stop shop for complete pipe and drape backdrop packages. Filled with everything you need, our pipe and drape backdrop kits are perfect for room dividers, photo shoot backdrops, holiday events, dressing rooms, crowd control, exhibition booths, and many other displays. They're easy to set-up, portable, and versatile -- changing the look of the room is as easy as changing the color of the drapes! We make it easy to purchase the perfect pipe and drape backdrop kit for your event by bundling all of the items you need into a convenient package for fast online checkout.And if you're looking for black pipe and drape, most of our kits have an optional upgrade to black Uprights and Bases for a sleek look. Our complete pipe and drape backdrop packages include everything you need to have an incredible backdrop set-up in just minutes. You get the upright and crossbar pipes, bases, and drapes with a click of a button! 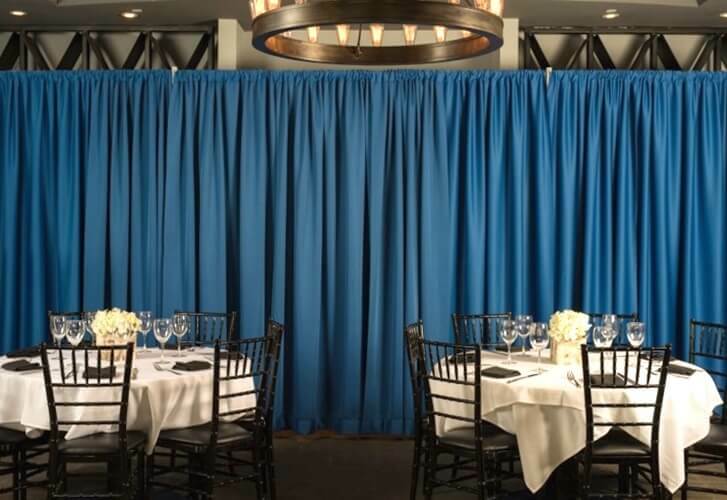 Get started by selecting your preferred pipe and drape backdrop package height from the options below. Any questions? Please don’t hesitate to contact us – we’ll be happy to help! Thanks for choosing Pipe and Drape Online as your go-to source for all things pipe and drape!